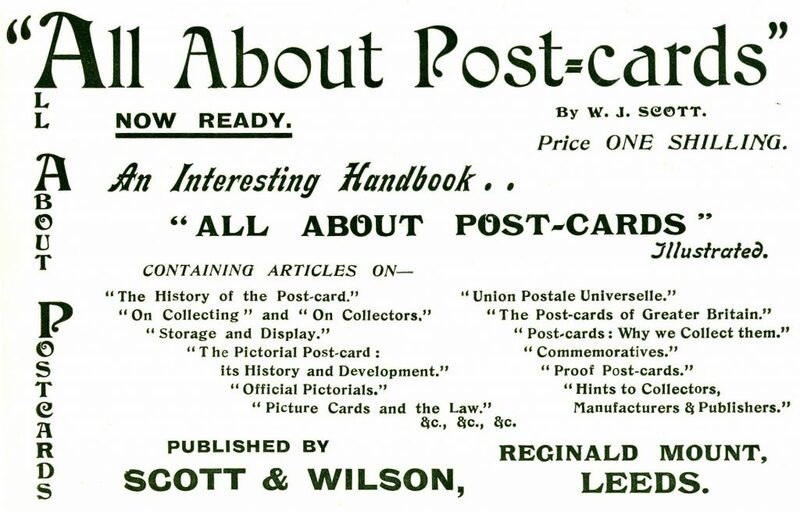 Poking around the Internet on a summer’s evening, I came upon a brief book review of All About Post-cards, one of the first postcard guides, published by Walter Scott in Leeds (England) in 1903. Appearing in The London Philatelist 12:140 (August 1903), the anonymous reviewer is of the view that the study of government-issued postcards (of the traditional picture-less type) does constitute a branch of philately. In stark contrast, the collection of privately-produced picture postcards is something else — and, whatever it may be it is not worthy of discussion in the august journal of the Philatelic Society, London! So there is an early attempt to define the place where philately ends and where the realm of what was then known as “cartophily” (and later as “deltiology”) begins. The key, in the reviewer’s mind, seems to be the “official” nature of both stamps and government-issued postal cards. As for the book, which sounds pretty interesting, it seems to have gone the way of so many of the guides and magazines that accompanied the postcard boom of the early 1900s. Other than the London Philatelist‘s book review, few traces of All About Post-cards exist online. If anyone has seen the book, we would be interested in hearing about it. Advertisement for Walter J. Scott’s “All About Post-cards” as published in a popular postcard collectors’ magazine. The reviewer’s rather snide opening suggestion that the book might be considered more self-promotional than scholarly relates to the fact that its author, Scott, was himself a significant publisher of picture postcards, particularly of scenes from around Yorkshire. He does not appear to have been connected with the Walter Scott who published postcards in Barrie, Ontario, around the same time. ALL ABOUT POST-CARDS. By J. W. [sic] Scott. Scott and Wilson, 4, Reginald Mount, Leeds. ‘“THERE is nothing like leather,” cried the shoemaker, and it is only natural that Mr. W. J. Scott should sing the praises of the wares that his firm so largely deal in. The book in question, containing some seventy pages devoted to the post card — official and pictorial — and thirty-four pages of the firm’s price catalogue of the same, bears out our opening quotation. None the less, this little volume will be found to afford both interest and information to those who are interested in entires, the author acknowledging his indebtedness to Mr. W. B. Warhurst, the well-known collector and worker on the subject of entires, and to Mr. E. W. Richardson, the editor of The Picture Post Card. The letterpress, divided into nearly twenty chapters, devotes about equal space to both sections of the subject, but there is an obvious leaning on the part of the author to the “fascinating hobby” of pictorial card collecting. Tagged "London Philatelist", "Walter J. Scott", 1903, Philately. « All In A Postcard: Go (North)West, Young Man! Error: Error validating access token: Session has expired on Friday, 12-Apr-19 20:21:58 PDT. The current time is Friday, 19-Apr-19 21:38:33 PDT.